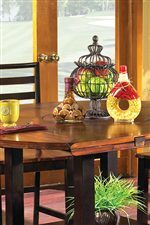 This three pack of occasional tables are promotional in scale only with quality solid acacia wood tops and solid wood legs. Featuring a dramatic two tone design, it will bring your living room to life. 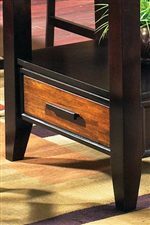 The Abaco 3 Pack of Occasional End Tables by Steve Silver at Walker's Furniture in the Spokane, Kennewick, Tri-Cities, Wenatchee, Coeur D’Alene, Yakima, Walla Walla, Umatilla, Moses Lake area. Product availability may vary. Contact us for the most current availability on this product. Finish Solid Acacia finished in a caramel coffee, with solid hardwood finished in deep brown. The stunning contrast of two beautiful finishes makes the Abaco collection from Steve Silver stand out. 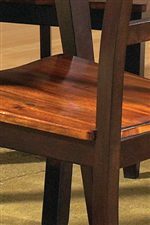 Table tops, chair seats and case fronts are all made of solid acacia wood, known for its unique dark streaks and heavy with clean knots, then finished in a warm carmel coffee finish. The base frames and legs are finished in dark brown providing an unequaled contrast. The collection consists of two regular height and two counter height tables, an entertainment center and occasional tables. This collection will work with most decor, with a neutral, though dynamic finish that will bring any room to life. The Abaco collection is a great option if you are looking for Contemporary furniture in the Spokane, Kennewick, Tri-Cities, Wenatchee, Coeur D’Alene, Yakima, Walla Walla, Umatilla, Moses Lake area. Browse other items in the Abaco collection from Walker's Furniture in the Spokane, Kennewick, Tri-Cities, Wenatchee, Coeur D’Alene, Yakima, Walla Walla, Umatilla, Moses Lake area.